Juvenile Justice (Care and Protection of Children) Act, 2015, S.60–Adoption of Child—Inter-Country Adoption—There is no provision in 2015 Act, which would empower the Court to impose a condition requiring the adoptive parents to bring the child to India meet the biological father and grandfather till she attains the age of majority. Comments Off on Juvenile Justice (Care and Protection of Children) Act, 2015, S.60–Adoption of Child—Inter-Country Adoption—There is no provision in 2015 Act, which would empower the Court to impose a condition requiring the adoptive parents to bring the child to India meet the biological father and grandfather till she attains the age of majority. 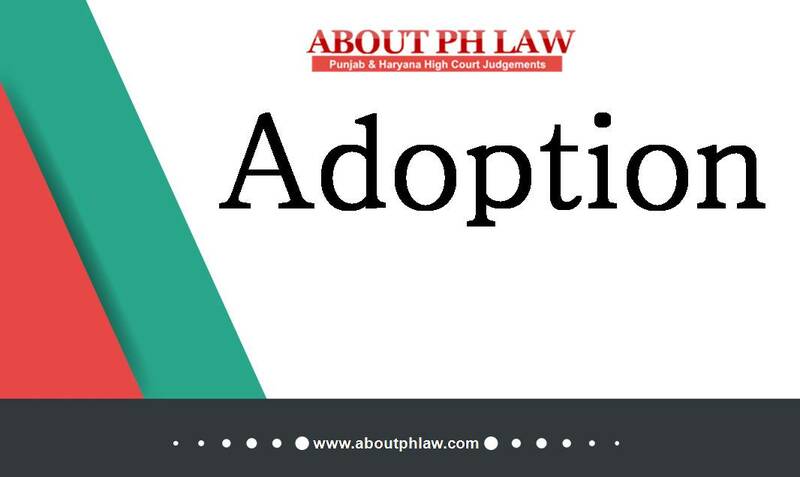 IMP : Adoption—Customary Law—As per the general custom applicable in Punjab and Haryana, the age and marital status is no bar with regard to adoption. Comments Off on IMP : Adoption—Customary Law—As per the general custom applicable in Punjab and Haryana, the age and marital status is no bar with regard to adoption. Birth Certificate– Name of a step father even on the asking of his stepson cannot be entered in the Birth Certificate replacing the name of the biological father. Comments Off on Birth Certificate– Name of a step father even on the asking of his stepson cannot be entered in the Birth Certificate replacing the name of the biological father. Adoption—Registered adoption deed cannot be held to be invalid merely on the ground that natural guardians have signed at place of attesting witnesses and not as executants. Comments Off on Adoption—Registered adoption deed cannot be held to be invalid merely on the ground that natural guardians have signed at place of attesting witnesses and not as executants.